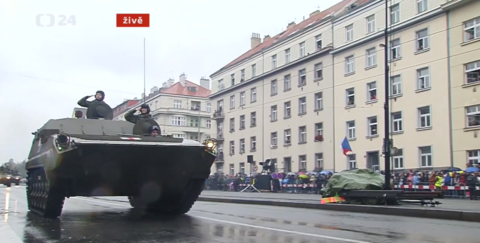 Armored vehicles refurbished by STV GROUP were showcased on a military parade in Prague. On Sunday, October 28, the Czech Republic celebrated the 100th anniversary of the foundation of Czechoslovakia. The second largest military parade in modern Czech history took place on Sunday in Prague on Evropska Avenue, thus marked a peak of the celebrations. The military showcased its vehicles among which some were refurbished by our sister company STV LAND SYSTEMS; four BMP-2 infantry fighting vehicles, four 120 mm PRAM self-propelled mortars, OT-90 AMB-S ambulance, and BVP-VPV recovery vehicle. BMP-2 is an armored infantry vehicle used to support mechanized troops. Its armor consists of 2A42 autocannon for 30x165 rounds and 7.62 mm PKT machine gun. 120 mm PRAM self-propelled mortar uses BMP chassis. The vehicle provides artillery support to mechanized troops against enemy personnel, armored vehicles or light field shelters. AMB-S ambulance is an armored tracked vehicle to track and transport wounded personnel. The crew is composed of a driver and a medic. The number of persons transported depends on their posture. The vehicle is able to transport four lying persons, or four sitting and two laying, or eight sitting. BVP-VPV recovery vehicle features a crane (max. load of 6.5 tons) and winch to recover damaged or stuck vehicles. Additional equipment features repair tools for field operations. Also, the vehicle can transport a crew of damaged vehicle. 7.62 mm PKT machine gun is used to protect the crew.